OOOH your iPhone videos look SOO NICE. And it's true, the stock cam on the iPhone 4 does a decent job for quick videos but if you wanted to stop being an amateur and use some real tools for video recording, Filmic Pro is what you need. 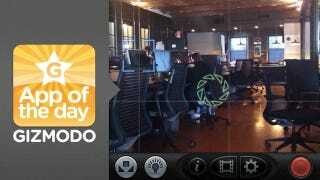 It's a video camera app that gives you a suite of features typically reserved for the pros. There's controls for screen resolution, frame rates, and framing along with focus and exposure locks so you can get the exact shot you want. Even more, you can monitor your audio, add some info to your video clips with a virtual "slate" and even encode your videos in a variety of formats. Basically, it's this whole toolbox of features that changes your dead simple cam to a "more realer" video camera (kind of like what Camera+ is for pictures, Filmic Pro is for videos). There's just so much in this app, I don't even know where to start. The different shooting modes (Super 35 matte, double reticle, single reticle) give you quick preset options to record a scene as best seen fit (action shots require different needs than a close up shot, for example). Obviously, it's not something pros will use to replace their gear but it will make your YouTube videos (or Facebook, Tumblr, Vimeo vids) look like something a pro did—but you did it on a smartphone. Having Filmic Pro's whole suite of pro features at your disposable is like having all the maximum customization that Apple never wanted you to have. Of course, you're still going to be limited in quality but you'll have enough tweaks to maybe overcome it.